Roasted butternut squash is an unexpected ingredient for this sauce. We love it with blue cheese, but you can substitute with freshly grated Parmigiano-Reggiano or goat cheese if you prefer. Place squash, shallot, and garlic on a baking sheet and toss with olive oil. Season with salt and pepper. Roast 35-40 minutes, turning once, until squash is softened and lightly browned on all sides. Allow vegetables to cool. Transfer to a food processor (in batches if necessary) along with 1 cup of stock and nutmeg and purée until completely smooth. Add a bit more stock if needed. Set aside. Bring a pot of water to boil and add salt. Add pasta and cook for 7-10 minutes, until al dente. Drain, reserving 1 cup of pasta water. Transfer pasta to a large bowl and add puréed butternut squash mixture and toss to combine. Season with salt and pepper. Add additional pasta water to sauce until you reach desired consistency. 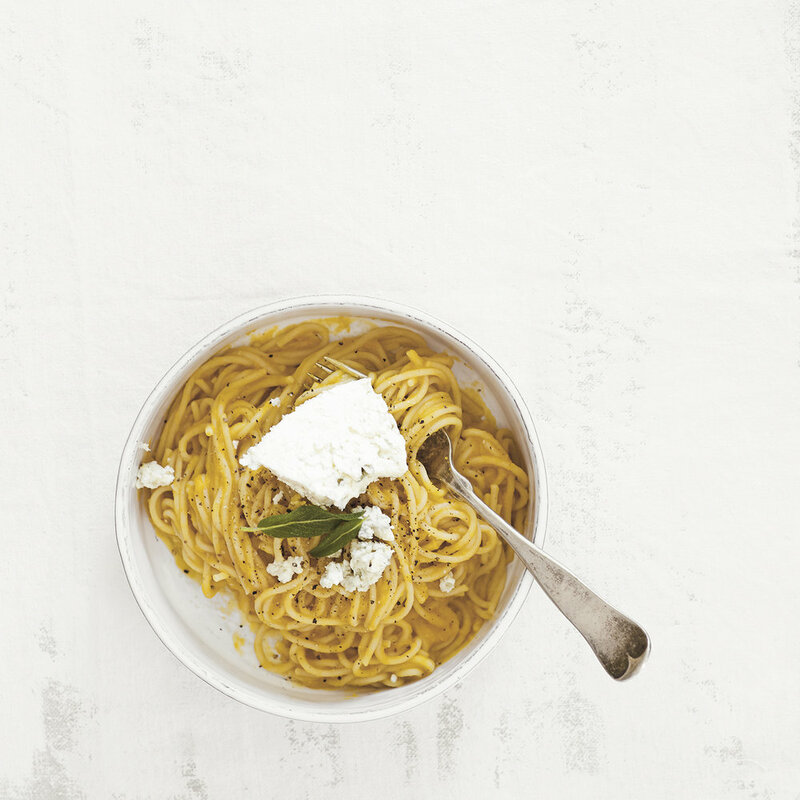 Divide pasta among serving bowls, top with blue cheese (if using) and sage and serve warm. cook’s note: For more texture, garnish with fried sage leaves. To fry: heat a thin layer of extra virgin olive oil in a nonstick pan to medium heat. Once shimmering, add sage leaves, a few at a time, and lightly fry until crisp, 10-15 seconds. Transfer each leaf as it’s done to a paper towel-lined plate.